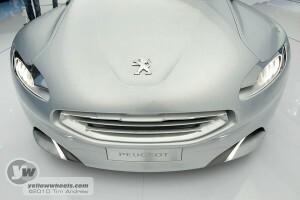 Peugeot SR1 show car heralds shape of things to come from the lion brand. 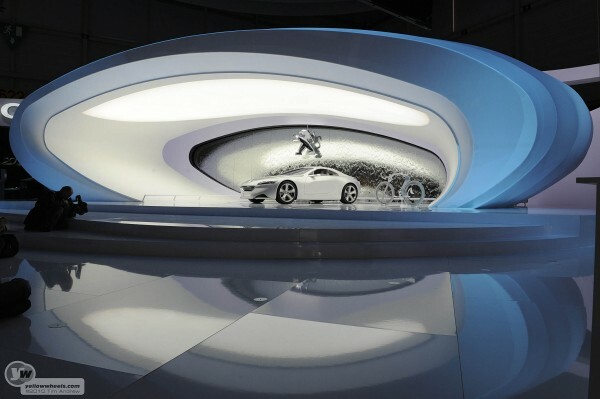 We’re not sure which was the most impressive: the magnificent show stand, easily the most elegant, prominent, and well designed at the show, or the Peugeot SR1 concept car basking in the soft pool of white light. 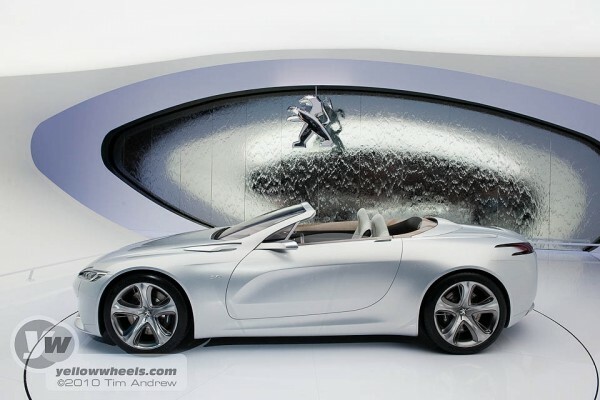 For once a waterwall backdrop looked entirely in keeping, and the open sports car was equipped with a roof, which looked at least splash-proof, thus staying on topic. If ever there was a motor show stand that made it easy to flatter a car, this was it. You could have put anything in there and it would look gorgeous, or at least well lit. So the car: it’s a hybrid. Yes go on: a convertible. Anything else? Pretty good looking. Nice classical proportions. Plenty of space age gizmos. 3 seats. Actually pretty predictable overall, but well executed, with good choice of materials and intriguing control layout. What it says is though: Peugeot has a new styling direction, and the only gawping mouths are those of their current model lineup. It also signals a change of badging as the house lion motif gains some rigid bulk: no longer a fussy organic beast, it’s transformed into a hewn-from-solid techno-lion. 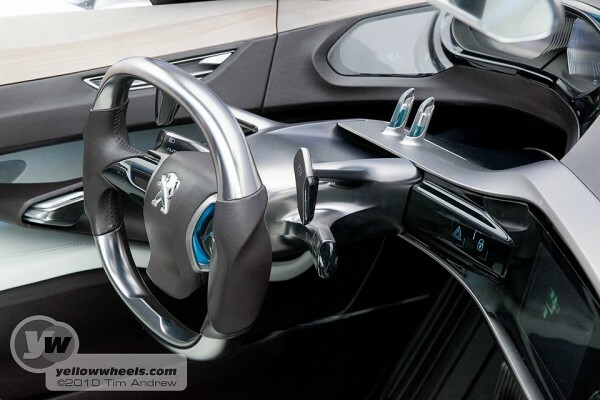 So just what are those two glass vials sticking out of the steering column? They are analogue displays of range and instant fuel economy. You can’t help thinking that they are the juices you’d swallow when range hits zero, all life has gone out of you, and you decide to exit the THX1138 world ! reinterprets the theme of the “Grand Touring Car”. 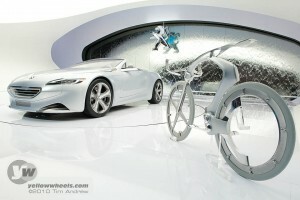 Peugeot SR1, the dream car par excellence. 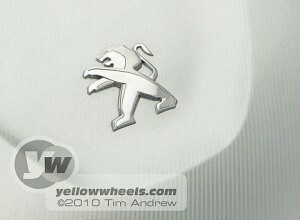 products, renewing Peugeot’s strong stylistic identity. and a very low centre of gravity. radiator grille contour) stand out, as if suspended. strength, with or without the hard top. The interior, too, promotes the idea of contrast. and new sensations for all its occupants. console, which can slide forward to improve access. combined with “the latest advanced technology”. materials such as nickel and satin-ﬁnished chrome. an unrivalled reﬁnement of perceived quality. mounted the mechanical components and suspension. the vehicle superb agility under all circumstances.